Price reduction shows owner's motivation! 58' Hatteras 58 LRC MASTERPLAN is under a captain's care with ongoing maintenance being performed routinely and is not only ready to go, but real ready to be sold! Heavily built, the Hatteras 58 LRC offers transatlantic capability. Designed by Jack Hargrave for comfort at sea the 58 LRC has three staterooms each with their own ensuite head. A day head is on the main deck. MASTERPLAN has recently had numerous updates on her systems and amenities. Aft deck has been enclosed and the cockpit has been designed to function also as a mooring connection for towing a large fishing vessel or dinghy. MASTERPLAN's owners have cleared off all personal belongings and are motivated sellers. 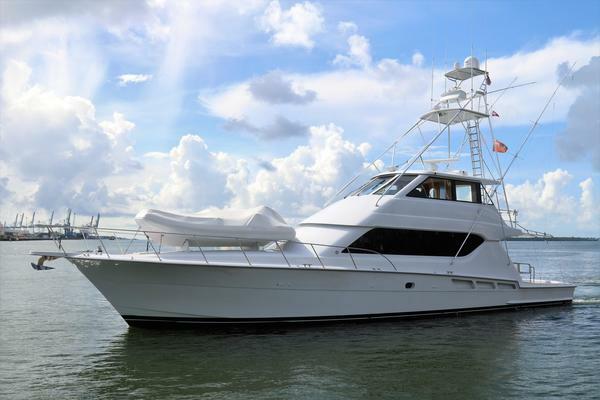 West Florida Yachts would love to guide you through a personal showing of this 58' Hatteras 58 LRC 1975. 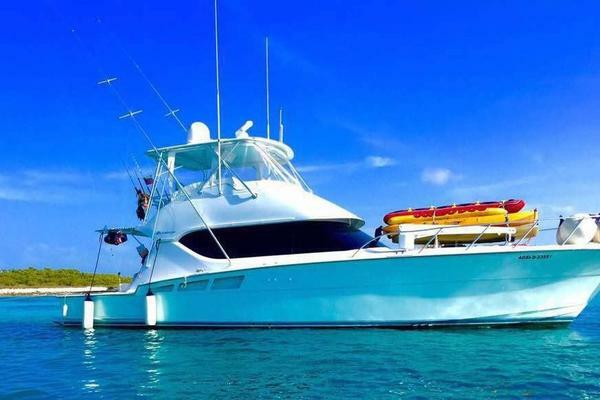 This yacht for sale is located in Fort Lauderdale, Florida and priced at $319,900. For a showing please contact us by filling out the form on this page and we will get back to you shortly! The Hatteras 58 LRC is known for her voluminous interior, generous accommodations, transatlantic capabilities, good seakeeping characteristics, and quality of construction with Hatteras pedigree. MASTERPLAN offers a large salon, generous galley, day head, 3 staterooms each with an ensuite head, and full-size engine room. Her exterior features include large enclosed aft deck, cockpit, full walk-around sidedecks, and large flybridge. Entrance to the pilothouse is from either port or starboard side doors. Entrance to salon from aft deck. Forward to port are side stairs that lead to master stateroom. Moving forward open galley is to port with day head to starboard. Pilothouse is forward of salon and galley with starboard side stairs that lead up to the flybridge and wing doors to deck. Stairs starboard side lead to below deck forward staterooms, heads, laundry room and engine room. The salon is generous in size and comfort with near panoramic views from large windows. Starboard side has an L-shaped sofa. In 2014 all flooring was replaced with new wood grain moisture resistant vinyl flooring. The engine room noise has been significantly reduced through the installation of 2 pounds per sq. foot acoustic insulation under the new flooring. The day head is located to port forward of the salon. The galley offers full conveniences for gourmet cooking as well as ergonomically designed for safety at sea. Wood grain vinyl sole and insulation is the same as salon. Entry to the pilothouse is from either port or starboard doors or from the galley. Starboard side stairs lead either up to the flybridge or down to the guest staterooms. The full beam master stateroom is accessed from the aft staircase in the salon. Located aft, this layout provides privacy from the guest staterooms which are forward. The stateroom is large and comfortable and offers generous stowage. Ensuite head has mirrored overhead and includes a bath/shower and vanity sink. This guest stateroom offers side by side extra-long gel mattress berths (2015) with upholstered headboards. All soft goods have been upgraded (2016). Wood grain vinyl flooring (2014). The ensuite head with walk-in shower has been fully refurbished (2016) including new mirrored overhead, counter-tops, sink, faucet, and new 115Vac and 12/32Vdc LED lighting. The forward guest stateroom offers a V-berth configuration with an ensuite head. Located below, forward of engine room. Full standing height walk-in engine room. Fuel consumption is 1.1 - 1.2gph at 8kn. The spacious flybridge has a full console, two helm chairs, and L-shaped seating with new Sunbrella cushions (2016) and Sunbrella cushion covers (2016) on both port and starboard sides. All helm instruments are protected by custom Sunbrella covers (2016). The entire non-skid deck was repainted with Awlgrip (2016). The fully enclosed aft deck on MASTERPLAN offers an additional area for entertaining, dining, or lounging. Two wicker sofas (2015) offer comfortable seating; The side doors and opening windows make it an all weather "second salon". All vertical surfaces and doors repainted in Awlcraft (2016). Sole repainted in Awlgrip non-skid (2016). Masterplan was originally set up as a mothership for towing a Cabo sportfisherman. The configuration included an aft diesel tank with a fuel transfer station as well as a 30 amp electrical connection in the cockpit for a 2nd vessel. This advantageous setup is still an asset for those with cruising toys, fishing boat, or diesel dinghy. The entire non-skid deck and swim platform were refurbished in Awlgrip (2014). MASTERPLAN's current owners have performed continual maintenance, upgrades, and improvements during their 5 year ownership. Previous owners as well have seen to upgrades and conscientious maintenance. The current owners have cruised New England and the eastern seaboard. MASTERPLAN is now docked in Ft. Lauderdale to expedite a sale. MASTERPLAN is ready for world-wide cruising.